Get Your Free Online Survival Course Now…Happy Holidays! Wow! Earthwork Programs is excited to announce its new membership site, where we will be offering online survival courses! If you’ve wanted to attend our Programs but haven’t been able to physically attend, these courses are for you! All you have to do is register with your first name and email address, and you’ll receive 5-weeks of lessons! At the recent annual Wilderness Extravaganza! 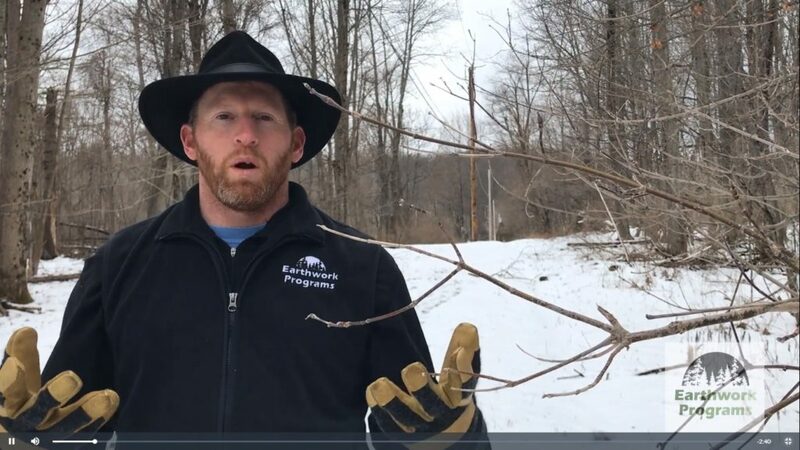 –our September Weekend of Wilderness Skills Workshops–a long-time supporter of Earthwork Programs’ vision, T.J. Loughlin videotaped the Workshops. And then created this amazing, fantastic, beautiful video! Thank you so much T.J.! It really shows the excitement of learning that happens at our Workshops! We had a lot of fun with this game! So what’s going on down by our rivers and streams? There is so much happening as rivers have totally shaped our world. They are constantly moving along the earth—creating habitat, moving mountains, building webs to connect us all. We have built our communities near them—as well as our farms; rivers were the “highways” of our ancestors, and today they still help us travel and navigate. They are such an important place for all wildlife’s food and shelter as well as migration routes for birds. Rivers also help generate power for our homes and industry. All of this helps connect us as a community…we even have festivals involving rivers! We learn valuable lessons about all of nature because it is all connected. This carries with it an importance of conservation, restoration and stewardship to take care of our wild neighbors and also ourselves. Let’s not forget all the fun we have too. We play and recreate on rivers–paddle our canoes, kayaks and inner tubes, swim, fish and even renew our spirit. These waterways create so much on so many levels. So let’s go down to the river together and see what is happening. As we walk through the woods, we hear the sound of the water as it flows through the land and draws us in to get a closer look. We may hear the rustle of the leaves under our feet, feel the sand or hard-packed soil along the banks. There are all kinds of bird songs, and perhaps, one in particular that hunts the rivers—the Kingfisher is making a head-first dive, fishing with its beak. As we get close to the edge, we move slowly, so as not to startle any of the wildlife because we know that even the fish in the water can see our approach. We see the signs of our neighborhood beavers and how they may have shaped this part of the river, and there are raccoon or mink tracks in the mud. We are walking on all the stones that have been placed at our feet by the power of the river. Ahh…we have arrived; let’s take off our shoes and feel the warm stones and cool water and mud spread between our barefoot toes. We look up and around, and notice the branches leaning over the waterway to get full light; it creates a natural shady spot for many creatures from which to retreat the hot sun…and for us too. Surrounded by trees—sycamores, alders, basswoods and willows—we are reminded of the amazing diversity of plants in and around the water—like cardinal flower, Japanese knotweed, cattails, watercress and many algaes—in these important watersheds. Looking around, we see the riverbanks covered in many sized stones—from boulders all the way down to grains of sand and even smaller particles, such as clay, are present too. As the earth is transformed, there is a natural sorting that happens along the river bottom and the banks that we see. As we look closer, we notice things have patterns. We are tracking the water, time and weather to understand the river ecosystem that we are currently seeing. Think of the channels of water—through rain, runoff, snow and flooding–that created the Grand Canyon. We are standing and witnessing a microcosm of that wonder of the world right in front of our eyes! The water flows through in shallow areas called “riffles,” and it runs where you see turbulence in the water; this also is where the water has the most oxygen and can be the coolest part of the river in the summer. It is where the aquatic invertebrates such as caddisflies, mayflies and stoneflies and others are very active in their day-to-day lives. These are great spots to watch just above the surface of the water and see the insects dancing, mating and falling, creating a concentric ring that signals the fish to feed. This is where you see a phenomenon called a “rise”–the trout rise, coming to the surface; you see the cresting of the water, and if in a clear pool, in middle or the tail of it, you can actually see the fish itself…size, color and grace as it moves. So put visiting the river on your schedule and experience this miraculous occurrence with friends and family. What kind of values do you think are instilled in your children when you create experiences and opportunities to have nature astound them? I am feeling grateful, and hope I see you down by the river.